BENGALI: Bātābī lēbu, Chakotra, Jāmburā lēbu, Mahanibu, Sadaphal, Pumēlō. BURMESE: Shouk ton oh, Kywegaw. CHINESE: Dou you, Pu tao you. FRENCH: Pamplemousse doux des Antilles, Chadec, Shadek. GERMAN: Pompelmus, Pampelmus, Riesenorange, Lederorangenbaum. HINDI: Bataawii niimbuu, Cakōtarā, Mahanibu, Sanadāphala, Sadaphal. JAPANESE: Buntan, Pomero, Bontan, Zabon. KANNADA: Chakota, Chakota hannu, Chakotre, Sakkota, Tōran̄ji. LAOTIAN: Kièngz s'aangz, Ph'uk, Sômz 'ôô. MALAY: Jeruk bali, Jeruk besar, Limau abong, Limau besar, Limau betawi, Limau bali, Limau serdadu. THAI: Som o, Ma o.
VIETNAMESE : Bưởi, Bưởi chùm Thái Lan. 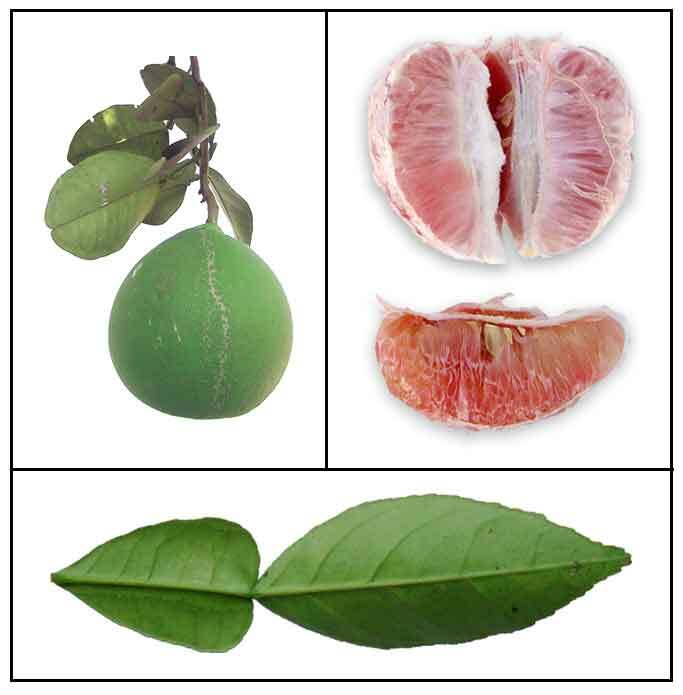 - Pomelo (Citrus maxima) and grapefruit (Citrus ) are both citrus fruits, but separate species. Grapefruit is a hybrid from the crossing of pomelo (C. maxima) and sweet orange (Citrus sinensis), the fruits differing in shape, color, size, and taste. - The occasional vernacular reference to is as "Chinese grapefruit" adds to the confusion. - Pomelo is the biggest of all the citrus fruits. 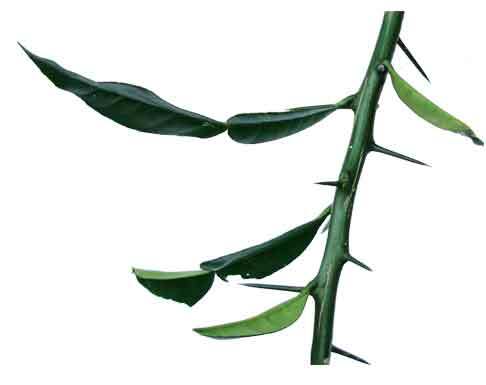 Suha is a small tree, 6 to 13 meters in height, with long, sharp, solitary spines. Leaflets are entire or nearly so, sparingly hairy beneath and on the margins, ovate-oblong to elliptic, and 8 to 12 centimeters long. Petioles are obovate and broadly winged. Flowers are white, fragrant, and crowded in short, axillary racemes. Fruit is large, obovoid to spherical, up to 20 centimeters in diameter. Rind is very thick and spongy, easily removed from the segments of the fruit. Pulp is pale yellow, pink or red, sweet or acrid, with large, distinct vesicles. - Found throughout the Philippines, in settled areas, usually planted. - Probably not a native of the Archipelago. - Found throughout all warm countries. - Native of the Old World. • Leaves - volatile oil, 1.7% - dipentene, 25%; linalool, 15%; citral, 3.5%; a-pinene, 0.5-1.5%; d-limone, 90-92%. Pericarp yields saccharose, reducing sugar; organic acid. • Rind yields a crystalline glycosidal bitter principle, naringin (previously reported as hesperidin), 0.2-1.6% ; , 10%; pectin, 10%; peroxidase. Also yields a volatile oil, "pompelmus" oil, containing d-pinene, 0.5-1.5%; d-limonene, 90-92%; linalool, 1-2%; citrate, 3-5%; geraniol, 1.2%; linalyl and geranylacetate; citral 25%; free alkaloid, 8.61%; and ester, 4.38%. • Phytochemical studies of various Citrus spp. yielded naringin, hesperidin, diosmin and naringenin. • Phytochemical study of the peel of the grapefruit isolated five compounds: friedelin, b-sitosterol, limonin, cordialin B, and a previously unreported compound, 7(3',7',11',14'-tetramethy)pentadec-2',6',10'-trienyloxycoumarin. - Food: Fresh fruit and preserved rind. - Fresh fruit is a good source of vitamin B, iron and calcium. - Nausea and fainting: Squeeze rind near nostrils for patient to inhale. - In the Philippines, leaves are used for aromatic baths. - Infusion or decoction of flowers, leaves and pericarp used as sedative for nervous affections; also for coughs and ulcers. - Peel or rind, dried or in decoction, used for dyspepsia. - Boiled seeds in a gallon of water can be used for sitz-baths. - In Malaya, lotion of boiled leaves used for painful swellings. In the Himalayas, fruit juice recommended for ulcers; used in diabetes; and mixed with black pepper and a little rock salt, used for malaria. Fruit juice with its pulp, with honey, is given to improve urinary flow. 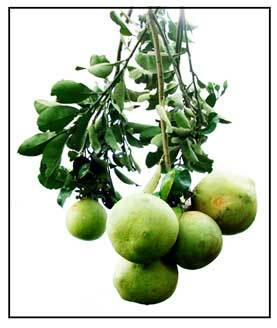 • Antimicrobial: Grapefruit seed extract (C paradisii) was found effective against P aeruginosa. The active ingredient was naringenin. Sorting Citrus names / Maintained by: Michel H. Porcher / MULTILINGUAL MULTISCRIPT PLANT NAME DATABASE / A Work in Progress. School of Agriculture and Food Systems. Faculty of Land & Food Resources. The University of Melbourne. Australia / Copyright © 1997 - 2000 The University of Melbourne. 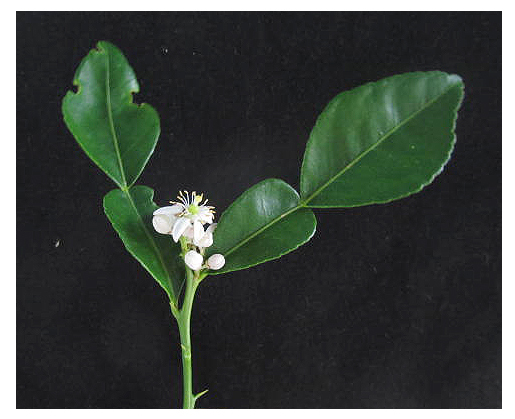 Evaluation of Antidepressant-like Effect of Citrus Maxima Leaves in Animal Models of Depression / Vikram H Potdar* and Swati J Kibile / Iran J Basic Med Sci., Sep-Oct 2011; 14(5): pp 478–483. Drug Interactions with Grapefruit and Related Citrus Fruits / Excerpted from Food-Medication Interactions 14th Edition / Table compiled by Dean Elbe BSc (Pharm), BCPP Clinical Pharmacist, Richmond, BC, Canada For more information and references, visit www.powernetdesign.com/grapefruit. Inhibition of Acetylcholinesterase Activity and Fe2+-Induced Lipid Peroxidation in Rat Brain In Vitro by Some Citrus Fruit Juices / Ayokunle O. Ademosun and Ganiyu Oboh / Journal of Medicinal Food. May 2012, 15(5): 428-434. / doi:10.1089/jmf.2011.0226.